In my extensive round-up of 2010 census maps yesterday I missed one very good map. WNYC has used Google Fusion Tables to create a great Google Map of the census data for the city of New York. The map allows you to view heat maps of demographic changes in New York over the last ten years. The map allows you to view population change and changes in race / ethnicity in each of New York's census tracts. If you are interested in how the map was put together John Keefe has written a great post on Making the WNYC Census Map. Twitter Nano lets you read real-time Tweets from anywhere in the world. Using the provided Google Map you can zoom in on any location and start reading the latest Tweets posted from there. As well as dragging and zooming the map you can also use the search box to enter a location. The Tweets for each location appear beneath the map, scrolling down with a nice transition effect. Why not let Google Maps take you back to the bygone days of the pre-digital world? This app I've put together superimposes historical YouTube videos on top of Street View to help transport you to a different age. Using the chromeless video player, available in the YouTube API, I've tried to match a number of vintage films with the same view as seen in Street View today. The videos are mainly of 1920's Britain but there are few turn of the Twentieth Century U.S. videos in there as well. To navigate to the different videos you just need to click on the thumbnail images at the bottom of the page. The New York Times has created a Google Map to visualise the changes in population in U.S. counties since 2000. Using data from the 2010 census the NYT has created a heat map that shows areas that have increased and decreased in population. The areas shaded blue have shown an increase in population size and the yellow shaded areas have decreased. If you select the 'more maps' button you can also see visualisations of population density, racial / ethnic distribution and housing. If you live in Washington D.C. you might want to check out this Google Map from the Washington Post instead. The map lets you see how demographics in D.C. neighborhoods have changed over time, using data from the 1990, 2000 and 2010 censuses. You can search the map by zip code or address and you can also view data by race / ethnicity. Moonshadow has released a great Google Maps application to visualise the 2010 New Jersey census data. The company has also released apps to visualise the census data for the states of Maryland and Oregon. These Google Map based apps allow users to closely examine the census data returns in each state. Using the applications you can set filters, colors and generate heat maps. You can display census block lines, as well as County lines, Congressional, State House and State Senate districts. You can even zoom down to the census block level and download the actual census data for a block. Moonshadow promise that more state maps will follow in the coming days and weeks as additional block level data becomes available from the US Census Bureau. This Google Map from The Chicago Tribune uses data from the 2010 census to show population changes in Illinois. The heat map shows areas that have grown and shrunk in population in the last ten years. The map seems to show a general trend of population growing in the centre of Chicago but people moving out of the outer neighborhoods. If you zoom in you can view the exact population change figures for each census tract. The LA Times has produced a Google Map to show the 2010 census counts by California’s congressional districts. The map shows how many residents the 53 congressional districts are above or below the target 702,905 population. The Texas Tribune, on the other hand, has created this Google Map to visualise the Texas population by race and Hispanic origin. The map displays the totals for each district, with darker colours representing higher rates of total population growth by race or Hispanic origin. 'Deficit reduction' certainly seems to be the buzz word of the decade. In the UK the British government is cutting public spending as if there will be no tomorrow. Almost as fast as the cuts are being made a new Google Map appears to try and show the impact of the cuts around the country. Channel 4 News has created a crowd-sourced Google Map of spending cuts in the UK and have asked users to submit their own knowledge of cuts to the map. The map markers are colour-coded by category and the categories can be filtered on the map via a drop-down menu. Anyone who knows of a spending cut not mapped can report it to Channel 4 and it will be plotted on the map. The Guardian newspaper reports that "organisations across the country are closing and losing services as councils and public bodies implement swingeing cuts from April." To document the cuts The Guardian has built this Google Map. The tabbed sidebar organises the cuts by category, for example, health cuts, education etc. Where Are The Cuts? say there is no 'official' list of about what is being cut and where, so they made this Google Map to help inform the public what is being cut in their area. The cuts on the map have been collected from official sources or entered directly by users of the map. It is also possible to browse all the cuts displayed on the map in list form. On Saturday New South Wales, Australia held its state election. The Sydney Morning Herald has produced this Google Map to visualise the results in each electorate. The map is coloured-coded so that you can tell at a glance which party won in each electorate. If you click on any of the individual electoral regions the results of the election are displayed in the map sidebar. NZ Aerial Mapping Ltd, at the request of the NZ Ministry of Civil Defence and Emergency Management (MCDEM), flew a Rockwell Commander 690 at 5,500 feet over Christchurch two days after the 22nd February earthquake, capturing imagery of the damage suffered by the city. As you can see from the shot of Christchurch Cathedral above the imagery provides an incredibly close aerial view of the city. Koordinates has created this Google Map that lets you view the aerial imagery on Google Maps. Using Google Maps means that you are able to find locations in Christchurch using the underlying map tiles and zoom in on the new aerial imagery. Donate to the Christchurch Earthquake Appeal. GeoCam.tv is a Google Map of webcams from around the world. The site has recently added live streams from Qik.com. The videos from Qik.com are real-time video streams from users' mobile phones. What I like about GeoCam.tv is that all the webcams can be viewed directly on the map. Currently the map shows over 1000 webcams from around the world, as well as the live Qik.com feeds. To view a cam just click on a map marker and the webcam image will open in an information window. The Department of Atmospheric, Oceanic & Space Sciences at the University of Michigan has created this Google Map that shows the air flow to a number of Japanese cities. The purpose of the map "is to illustrate whether the air arriving in select locations has previously been near the crippled Fukushima Daiichi nuclear power plant." To view the air direction record for a city you just need to click on its map marker and select a date from a calendar. Trajectory lines for the wind on that day are then displayed on the map. The yellow overlay represents the probability of an upwind region's potential to influence air quality at this location on your selected day. The GLOBE at Night organisation are endorsing the Earth Hour event on March 26 and would also like you to help them gather data as part of their research into light pollution. All you need to do is determine which of the magnitude charts of the sky most resembles what you see and complete a short form. Mapstagram is a super-fast real-time Google Map of photos taken with the Instagram iPhone app. When the Mapstagram map first loads it displays the most recent photos from a number of U.S. cities. After the initial photos have loaded Mapstagram goes into real-time mode. As photos are uploaded by users in these cities, they are immediately displayed on the map in real time. Gramfeed uses the Instagram API to present the best photos from Instagram on Google Maps. It also allows users to view their own photos, a time-line of those they follow, read comments on photos and Tweet about photos and much, much more. Jog.fm helps you find the best music for your run, walk or bike ride. To find the best tunes for your run all you need to do is enter the average time it normally takes you to run (or walk or cycle) one kilometre. Jog.fm will then suggest tracks for you to listen to based on your pace. Jog.fm also provide a Google Maps application that lets you plan your run. To plan a route just enter a start and finishing point and Jog.fm will suggest a route and even tell you the distance. In the U.S. over 54 publicly owned networks have been established in cities across the country. These networks have an objective to maximize value for the user rather than for the benefit of stockholders and corporate executives. Community Broadband Networks has produced this Google Map to show the location of these publicly owned citywide wired networks. The CBN claim that "this is the first map to comprehensively show the broadband networks that are structurally designed to meet community needs first. Most of the networks are owned by local governments, but nonprofit networks will also be incorporated over time." The map uses colored map markers to differentiate between cable networks and FTTH (fiber to the home). If you click on any of markers you can view the population served by the network and a link to the network's website. In the UK the Foreign and Commonwealth Office issues travel warnings and advice about countries it is safe to travel to. The Guardian newspaper has used Fusion Tables and Google Maps to create a world map of the 53 countries that the FCO currently has travel warnings for. Even if you are not interested in travelling the world the map provides an interesting view of countries currently affected by conflict or disaster. Do bear in mind however that where the FCO has issued more localised warnings, for example not to visit Ciudad Juarez in Mexico, The Guardian's map displays the whole country as unsafe. Measurement Lab have provided Google's Public Data Explorer with two year's worth of global internet speeds. Using the data you can compare the download & upload speeds in different countries. You can view the data in a number of formats including graphs and pie charts. Thankfully you can also view the data geographically via Google Maps. Using the Google Maps tool you can compare any combination of countries. For example you can see how download speeds in the U.S. compare with the Netherlands, Denmark and Norway (very poorly BTW). The map also comes with an animated time-line tool so that you can see how speeds have risen or fallen worldwide over the two years that the data is available for. Routema.kr is a simple to use tool for creating a route on Google Maps. If you want to show friends how to get to your house, or if you want to share the route of your favourite walk, or even show people how to get to a bar or restaurant then you might want to use Routema.kr. Creating a route with Routma.kr is as easy as clicking on a Google Map and adding a description. 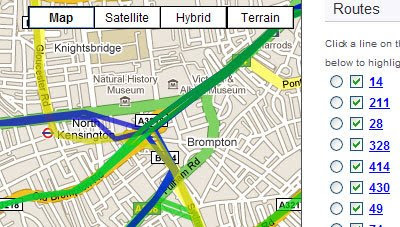 When you have created a route you get a dedicated web page with a map and a description of the route. You can then share your link with the world and nobody need get lost ever again. Each route created comes with a 'Share This' button. This allows you to send a link to the route by e-mail directly from Routema.kr and to also grab the embed code to add the map to your own website or blog. If you need to take a taxi but are unsure of the likely cost then you can use the Taxi Fare Finder calculator to find out the likely price before your journey. To start a calculation you just need to select a city from a drop-down menu. If your location is not listed you can still calculate the likely fare based on a typical U.S. cab fare. Next, you just need to enter your starting location and destination. The estimated fare is then displayed next to a Google Map of your route. The driving directions for your journey are also displayed beneath the map. London BusMapper can tell you which London bus you should take for your journey. London's huge public bus network is a great way of getting around the city. However, with so many routes, it can be difficult to work out which bus you should catch. With London BusMapper all you need to do is click on your starting point and destination on a Google Map and the app will show you which buses you can take. All the different options are immediately displayed on the map and the locations of the bus-stops you need are clearly shown. On a Bus is a Google Maps mashup of London bus routes. To use the site just enter a London bus number and On a Bus will show the bus's route using Google Maps (try '1' if you are not familiar with London Bus numbers). The bus route is shown on the map with a polyline and all the bus-stops on the route are indicated with map markers. If you click on any of the map markers on the route nearby points of interest are displayed in the side-panel. What Bus? is a Google Maps mashup of all the London bus lines. It is possible to search the map by postcode or by just panning the map. The bus routes are shown on the map by coloured polylines. Clicking on any of the bus routes will take you to an individual route just for that line. What Bus? is also available as an iPhone app. Bus-Tops is a fascinating public art project in London. Bus-Tops will be installing screens on the roofs of bus shelters across London, creating a medium for artists to show their work. Currently the Bus-Tops team is asking Londoners to choose which bus shelters they would like Bus-Tops' screens to be installed on. If you want to suggest a bus stop shelter in London for a Bus-Tops screen you can do so by simply entering an address or postcode on the Bus-Tops Google Map. Once you enter a address you can view bus shelters near that location. Clicking on a bus top marker will bring up more information on the shelter. GRNET (Greek Research and Technology Network) is the national research and education network of Greece. GRNET provides internet access to the Research, Academic and Education communities of Greece. The GRNET Network Topology Tool uses Google Maps to show the location of the nodes on the network and to provide information about the interconnections between network devices, the interfaces' descriptions and tags along with RRD traffic graphs per interface. The tool is also available in a lightweight version, which can be easily embedded into other websites. The map includes some custom made zoom buttons that nicely complement the Google Maps navigation controls. The buttons allow the user to quickly zoom back to a level that displays the whole network. The Worldwide Coordinate Converter is a nice tool to convert data between different geodetic systems. To use the converter select the reference system of your data and the reference system you want the data converted to. You can then enter the coordinates manually, click on a Google Map, or enter an address. Finally, when you press convert, your coordinates will be returned in your chosen geodetic system. The converter can also accept data with comma separated values (CSV). Xuland is a Google Maps based social network that lets you share comments, pictures and links with those around you and search for venues, events and deals around your location. Using Xuland you can comment on any location. If you like the comments of other Xuland users you can choose to 'follow' them. Xuland also has plans to offer comment badges soon to reward you for adding your thoughts. You can also view nearby venues from Yelp, view deals for local venues from third party sites such as Groupon, and search for local events from Eventful. The UN nuclear watchdog, the IAEA, warned today that the situation remains 'very serious' at the Fukushima nuclear power plant. Many Japanese citizens are therefore obviously worried about radiation levels. This TargetMap creation uses Google Maps to show the real-time radiation levels by prefecture. The data comes from the the System for Prediction of Environment Emergency Dose Information(SPEEDI). The results shown are the maximum values recorded in the latest update. RTDN have created a Google Map of radiation level readings in Japan with data from Pachube and Marian Steinbach. Each marker on the map displays the radiation level and the time of the reading. RTDN are also looking for people to submit their own accurate readings to the map, which you can do via a short form. To provide context for these map you should also check out O'Reilly Radar's Open Street Map visualisations of radiation levels in Japan. The O'Reilly maps compare two days of recent radiation data with the normal radiation levels in Japan. In 1811, John Randel created a proposed street grid of Manhattan. The New York Times has created a Google Map that allows you to compare Randel's map to modern-day Manhattan. The map of street openings since 1642 allows you to visualise the growth of Manhattan. If you use the time-line control you can watch the spread of Mahattan from just a few streets to the present urban sprawl.